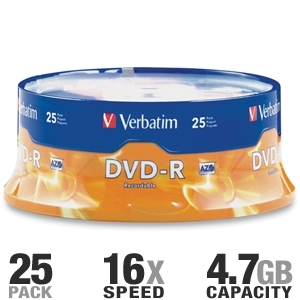 Verbatim 95058 DVD-R discs offer 4.7GB or 120 Minutes of write-once storage capacity, superior recording quality, and compatibility with 1X to 16X DVD-R writers. Verbatim 16X DVD-R discs allows users to record a complete 4.7GB/120Min disc in approximately 5 minutes. Recognized as the choice of professional users, Verbatim 95058 DVD-R discs offers the optimal �Advanced Azo� recording dye, which provides the highest level of read/write performance, reliability, and archival life. Verbatim 95058 16X DVD-R discs media is compatible with Pioneer, Apple, Sony, Panasonic and other leading drive manufacturers.